This Harry Potter party was one of my favorite parties of all time. 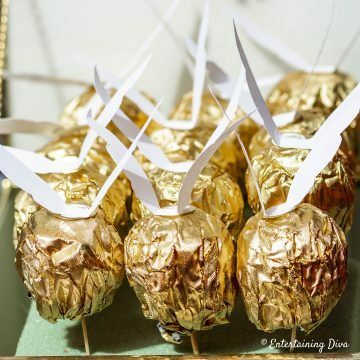 Between the Harry Potter party decor, printables and these Harry Potter table decor ideas, the whole party was a huge success! 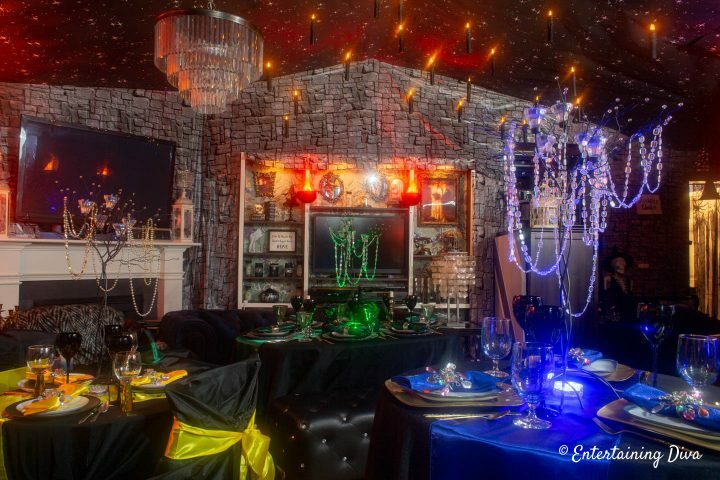 I recently hosted a Harry Potter party where I wanted to re-create the Hogwarts great hall in my living room…on a much smaller scale of course! One of the big elements in the great hall is the long tables where each of the school houses sit. Since I don’t have the space (or the tables) to actually set those long tables, I decided to create smaller versions of each of them, using the house colors and crests to make them different. 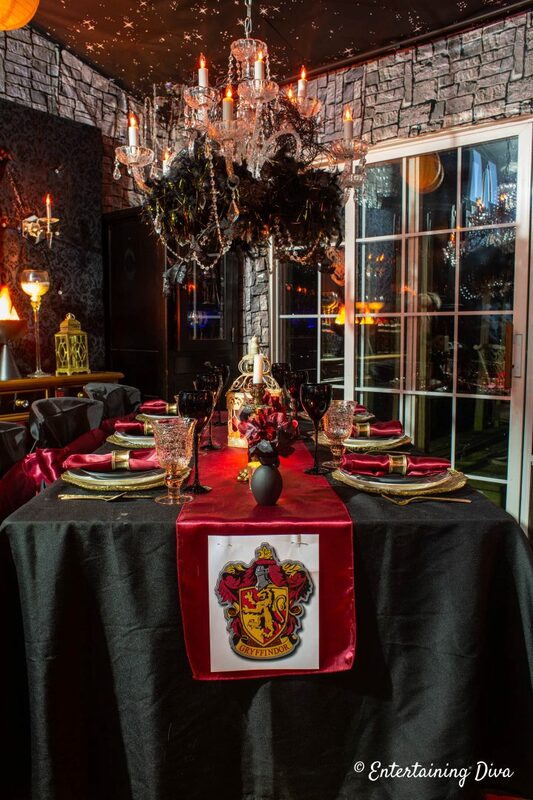 For my party, I did 4 tables (one for each pf the Hogwart’s school houses), but you could just go with the Gryffindor table (that’s Harry Potter’s house) if you don’t need to seat that many people. 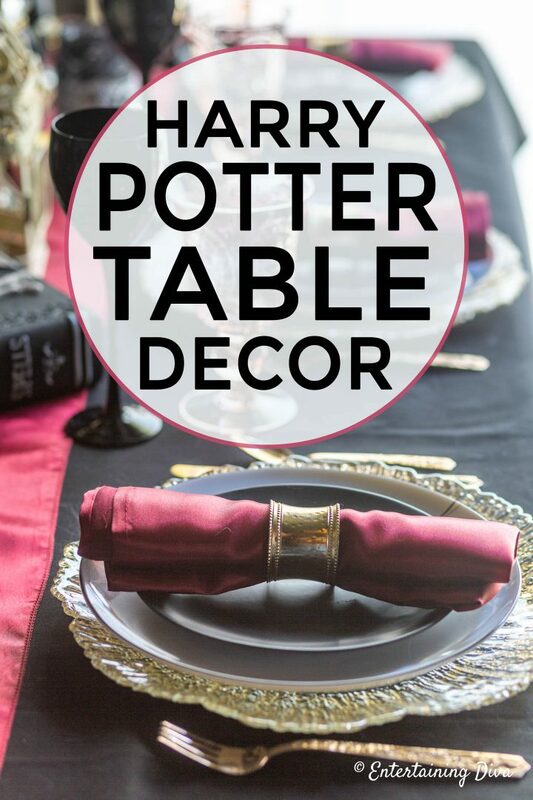 Keep reading to see all of the Harry Potter table decor ideas that I came up with. While I wanted each of the tables to be different and represent their house colors, I also wanted to keep some continuity between the tables. 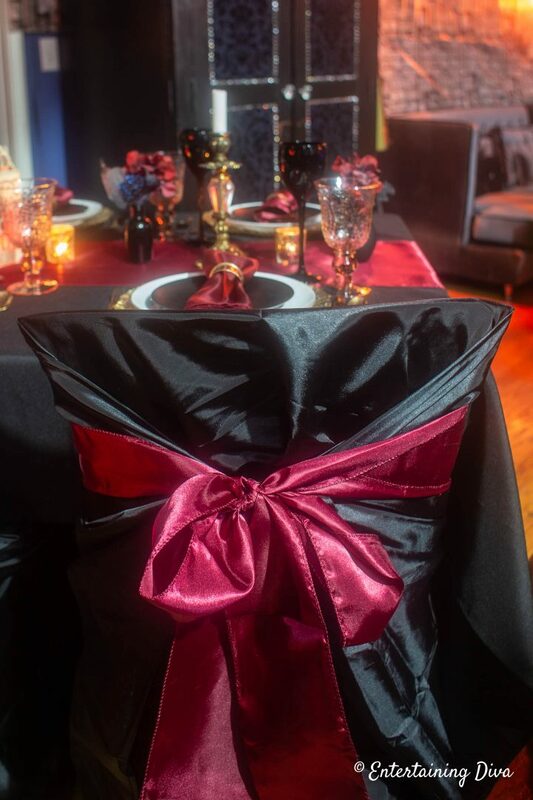 black table cloths and chair covers. 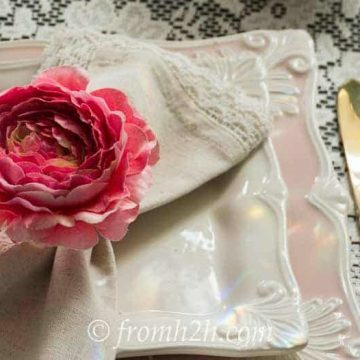 a table runner, napkins and chair sashes in the main house color. a printable house crest pinned to the front of the table. (You can find all of the the Harry Potter printables I used HERE). Now, we’re ready to decorate some tables! 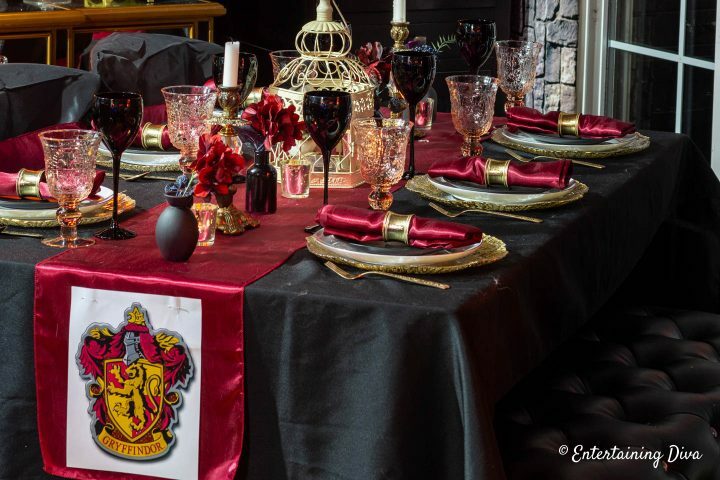 The first table setting that I created using my Harry Potter table decor ideas was the Gryffindor house tablescape. 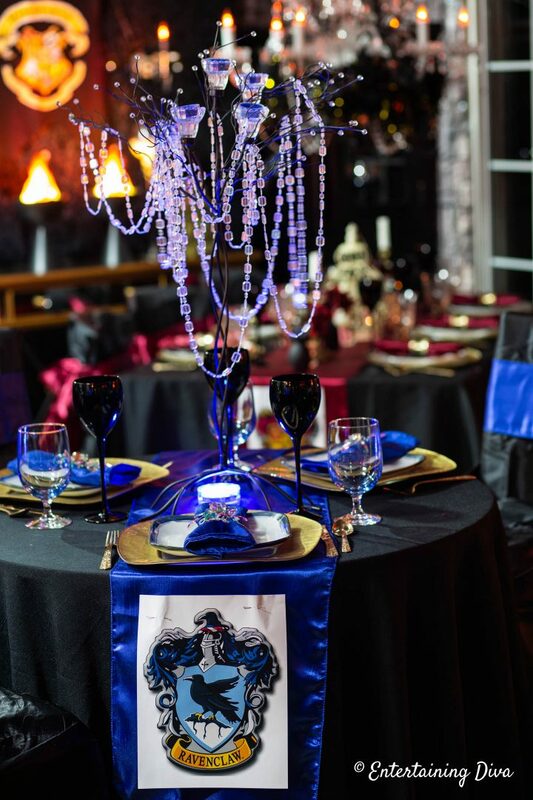 As I mentioned above, I used a black tablecloth on all of the tables and black chair covers on all of the chairs. That helps to make all of my mismatched chairs and tables look like they belong together. 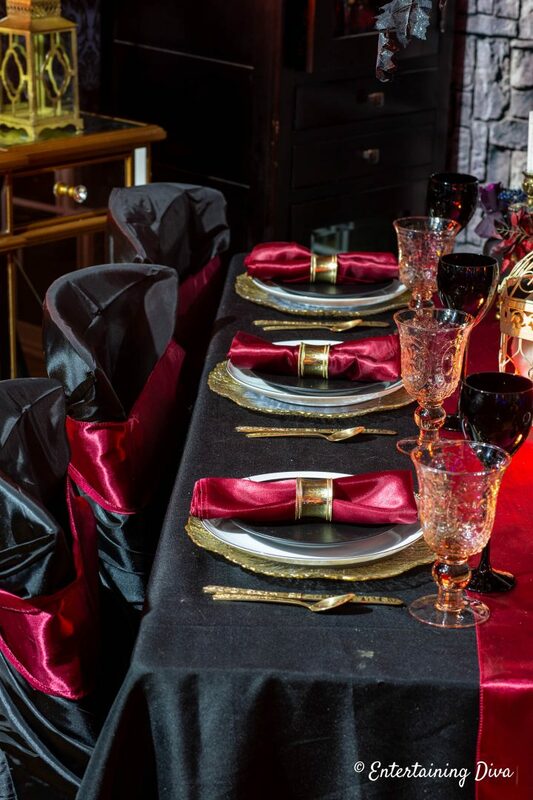 For this Harry Potter table setting, I used red as the main color for the table runner and the napkins. Then pinned a printable Gryffindor house crest to the front of the runner. 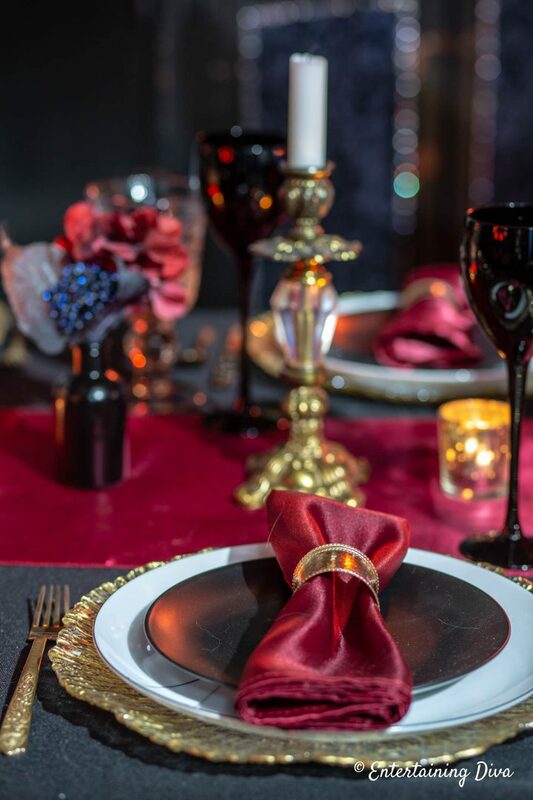 The red chair sash is the same color as the runner and the napkins on the table which helps to tie them all together. 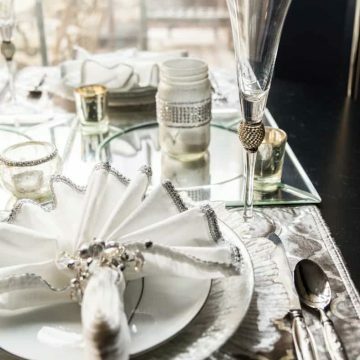 For the place settings, I used a gold charger, white dinner plates and matte black salad plates. 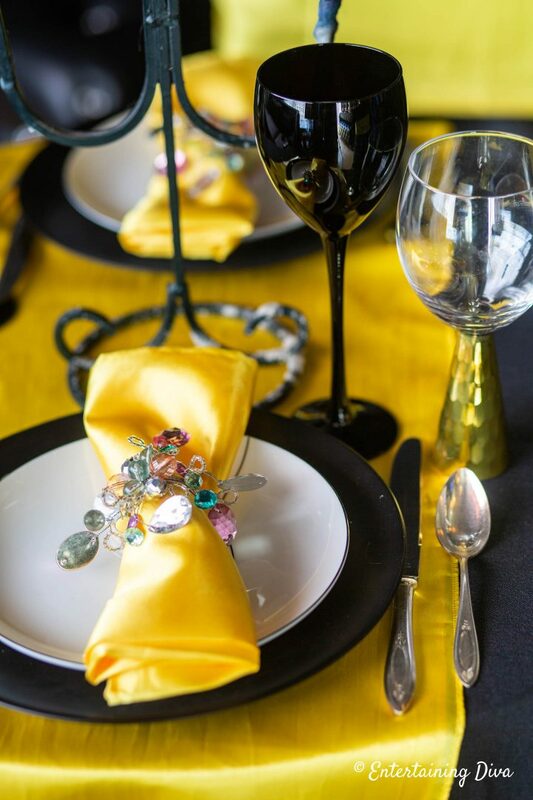 The cutlery and the napkin rings are both gold to go with the Gryffindor house colors. 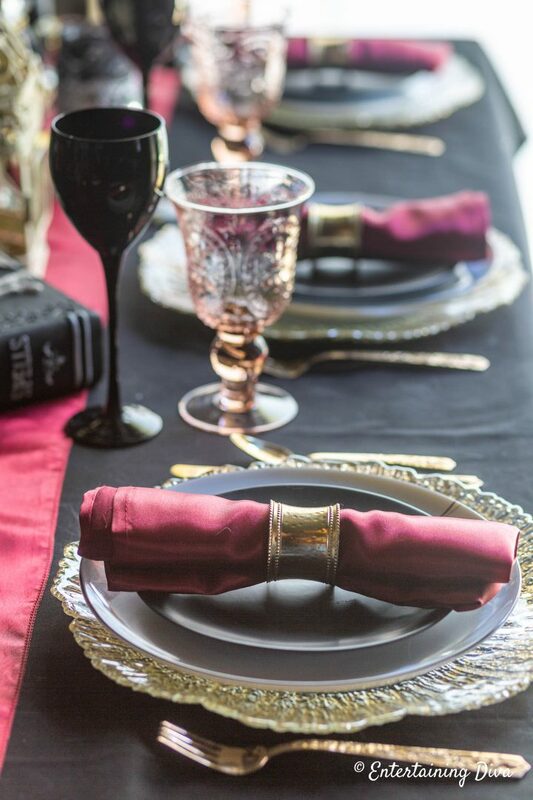 Pink water goblets and black wine glasses finish off the Gryffindor place setting. 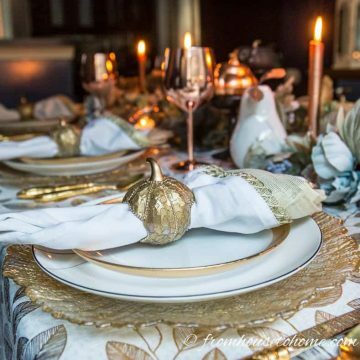 For the centerpiece on this Harry Potter table setting, I used black, white and gold accents that would stand out against the red runner. 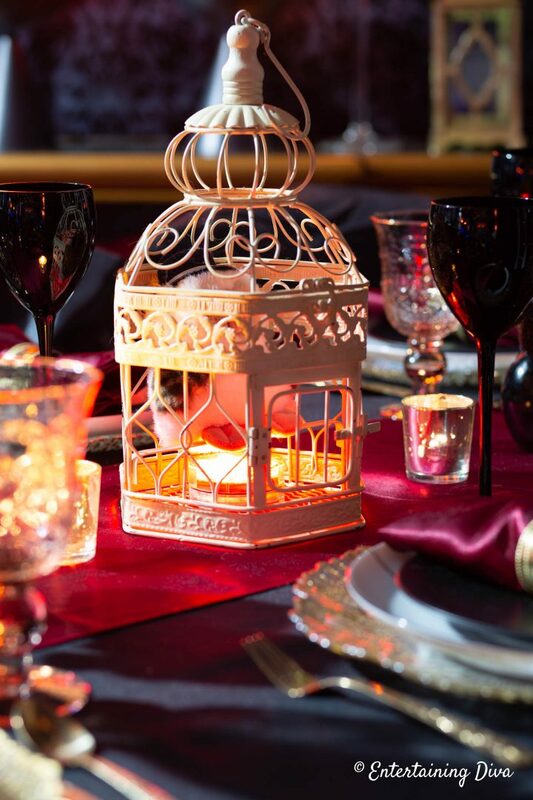 Little black vases with faux flowers, brass candle sticks and white candles are all easy to add to the centerpiece. This DIY black lace candle holder is made from a mason jar and sits on top of a spellbook prop (I got this at Michael’s around Halloween). The white bird cage has an owl inside (which you can’t see very well in the picture)…my version of Hedwig. 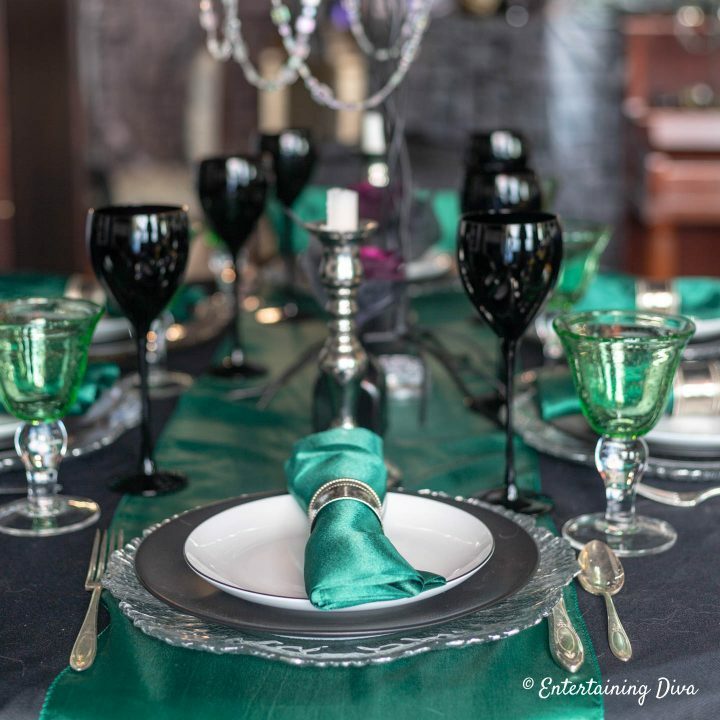 The next table setting for my Harry Potter table decor ideas is for Slytherin house with the colors silver and green. 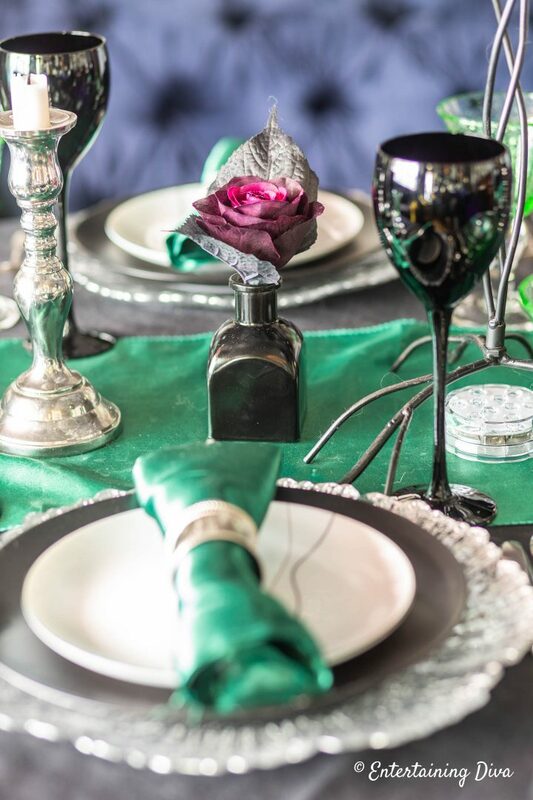 I used the same black tablecloth, chair covers and wine glasses as I did for the first table. 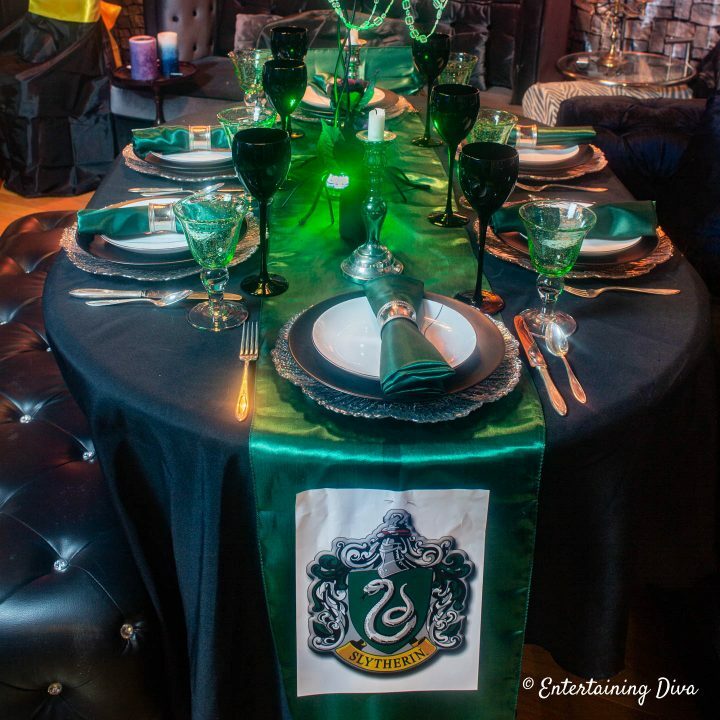 But this time the runner and napkins are green, with the Slytherin crest pinned to the front of the table. The chair sashes are the same color green as the napkins. Are you sensing a pattern here? 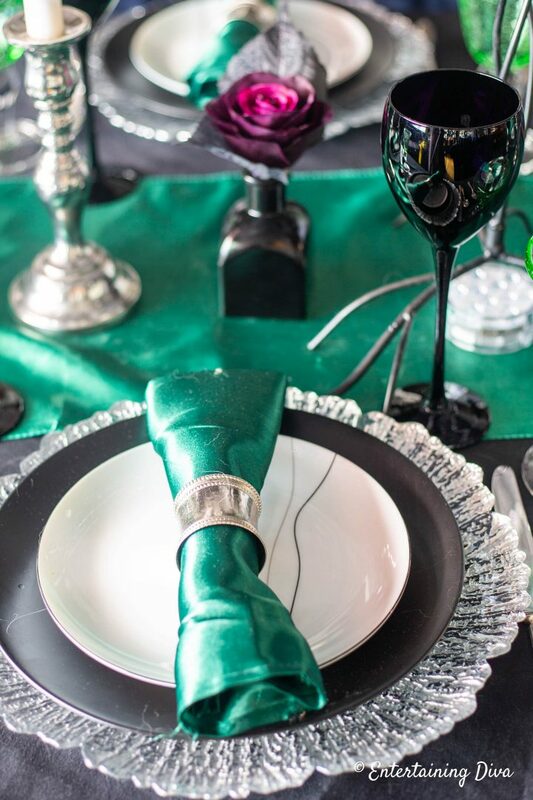 For this Harry Potter table setting, I used silver chargers, matte black dinner plates and white salad plates. 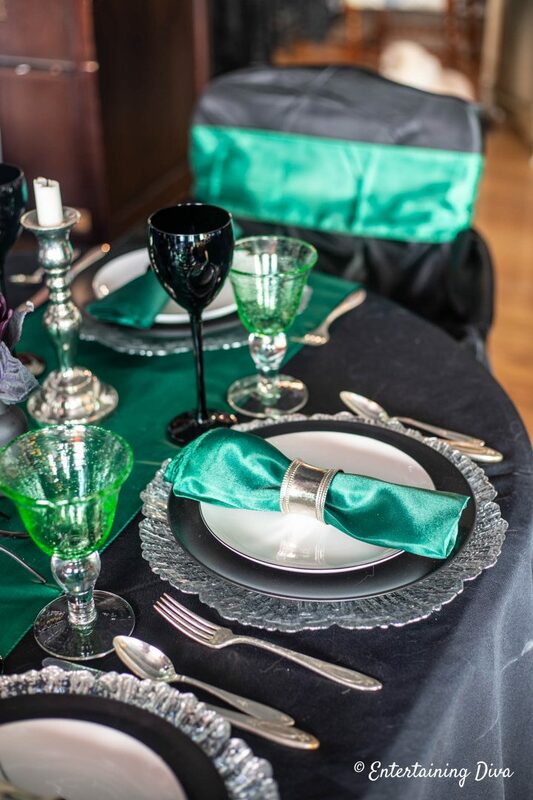 The napkin rings are silver and the napkins are green. 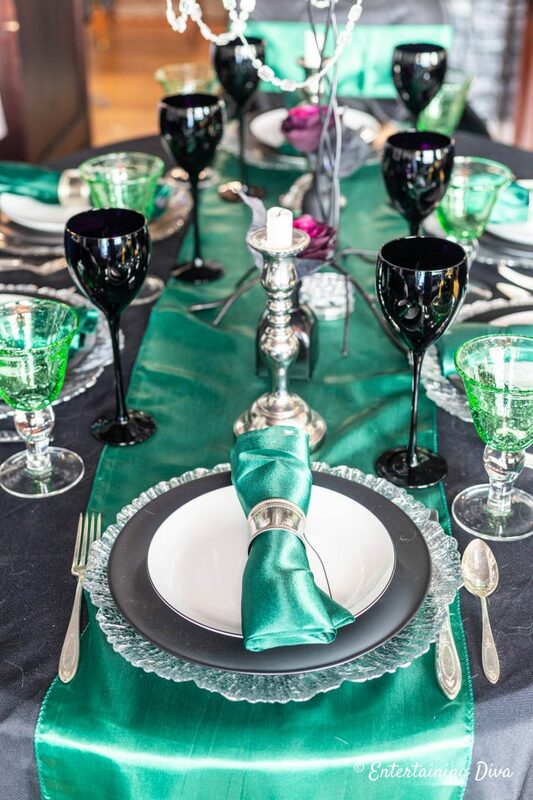 Silver cutlery and green water glasses finish off the Slytherin house place setting. 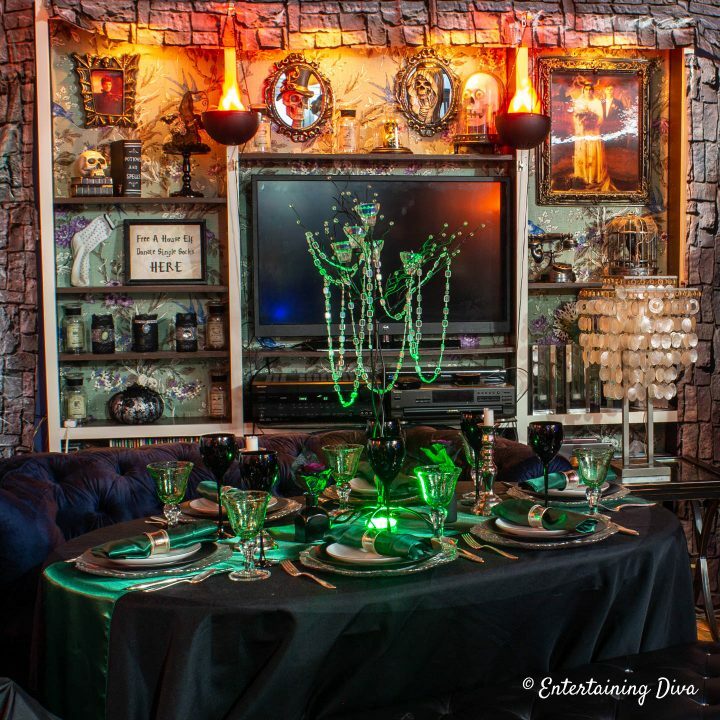 The centerpiece for this Harry Potter table decor is made up of small vases (that look like potion jars) with faux flowers and silver candle sticks. 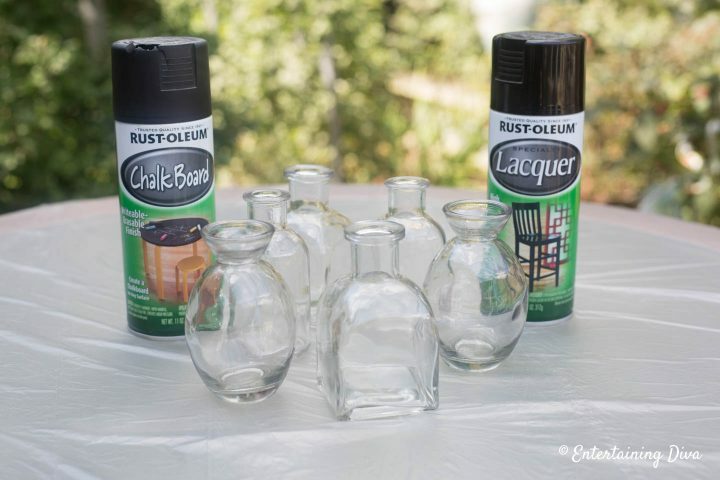 These vases are actually meant for wedding favors so they’re very inexpensive. I spray painted some of them with chalkboard paint and some with black lacquer to make them look like I wanted them to. Then as the focal point of the table, I installed a candle tree draped with a faux crystal string and a green uplight at the bottom of it. The light really makes the table stand out. 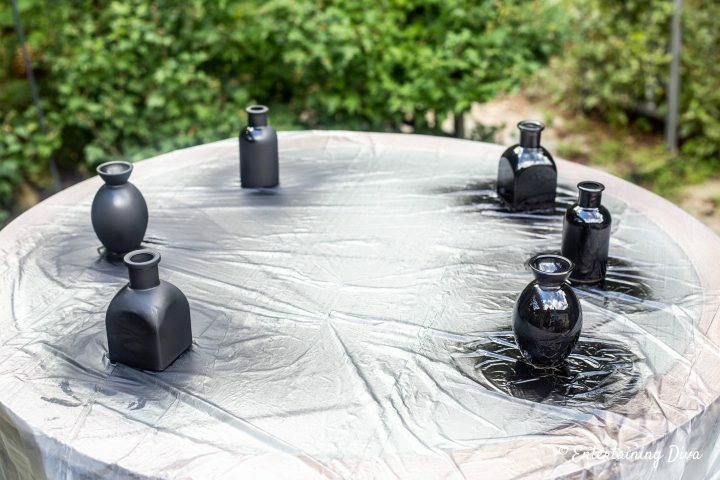 Once again, this table has the same black tablecloth, black chair covers and black wine glasses. 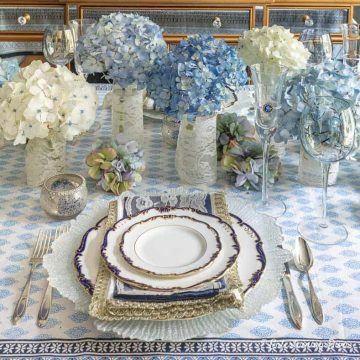 The table runner, chair covers and napkins are all the main house color – blue. And the Ravenclaw house crest is pinned to the front of the table runner. This table is quite a bit smaller than the other two tables I have done so far, so I wasn’t able to fit many “extras” onto the tablescape. 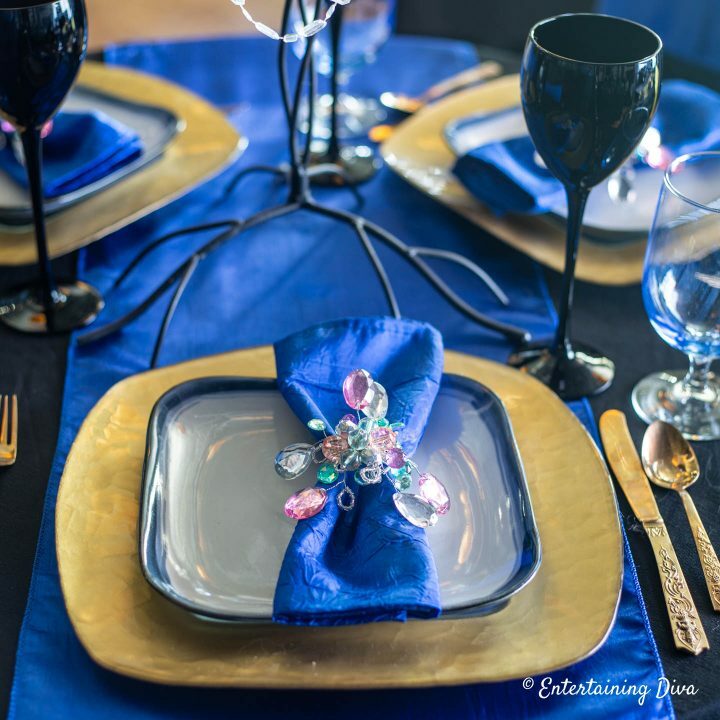 For dinnerware, I went with a gold glass charger and a blue-rimmed white plate. 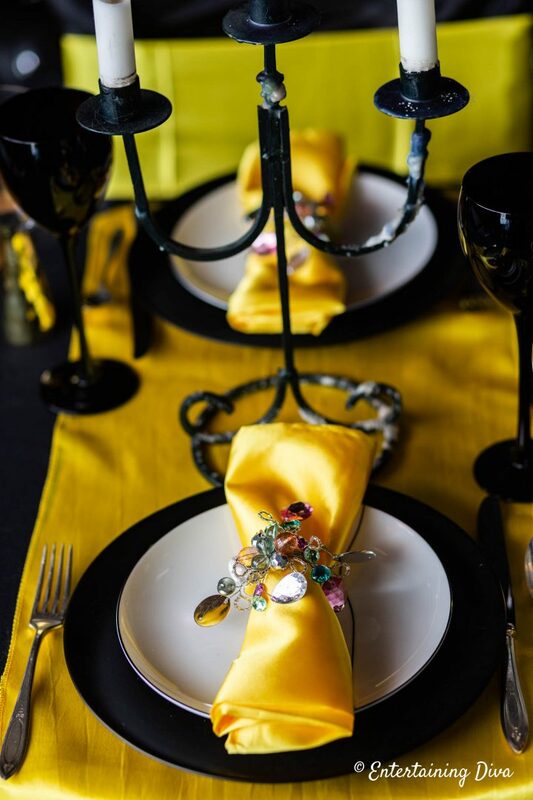 I love the sparkly napkin rings which go with pretty much any thing because of all the colors. 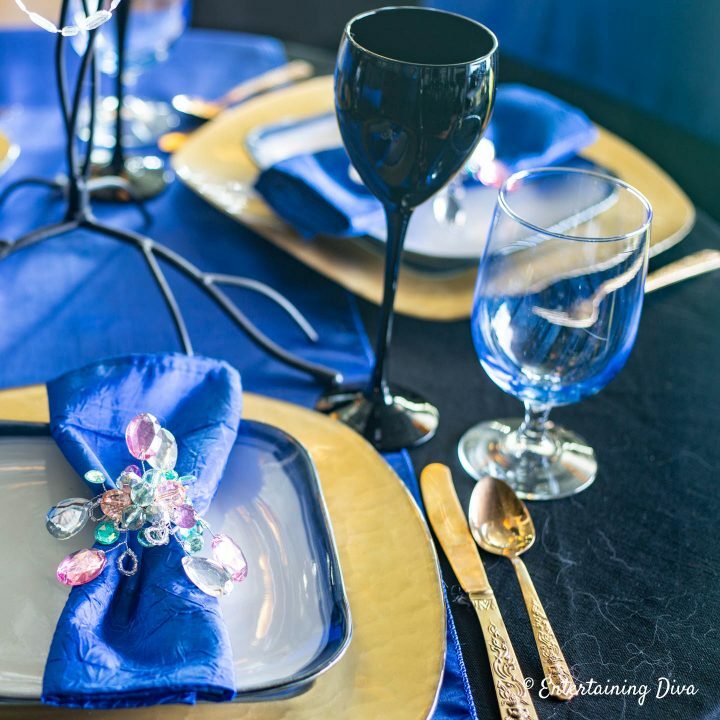 Gold cutlery and blue water glasses finish off the Ravenclaw House place setting. 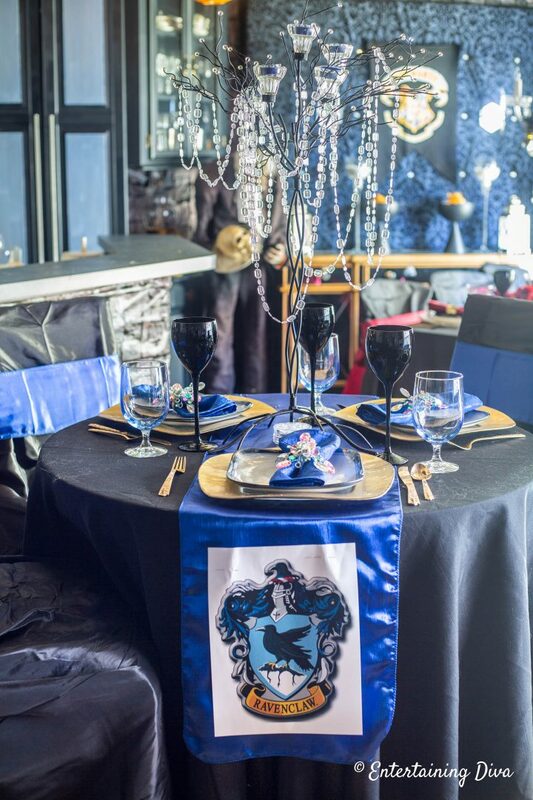 With the small size of the table, there wasn’t much room for a Ravenclaw House centerpiece. A candle tree hung with faux crystals and a blue uplight fits perfectly in the middle of the table. And the light really makes the centerpiece stand out. 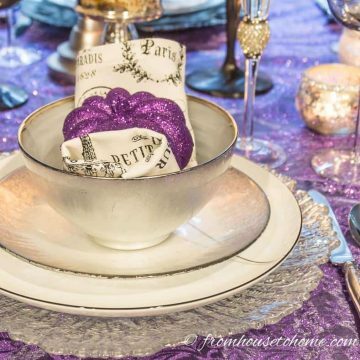 This is one of my favorite ways of adding some drama to a table! 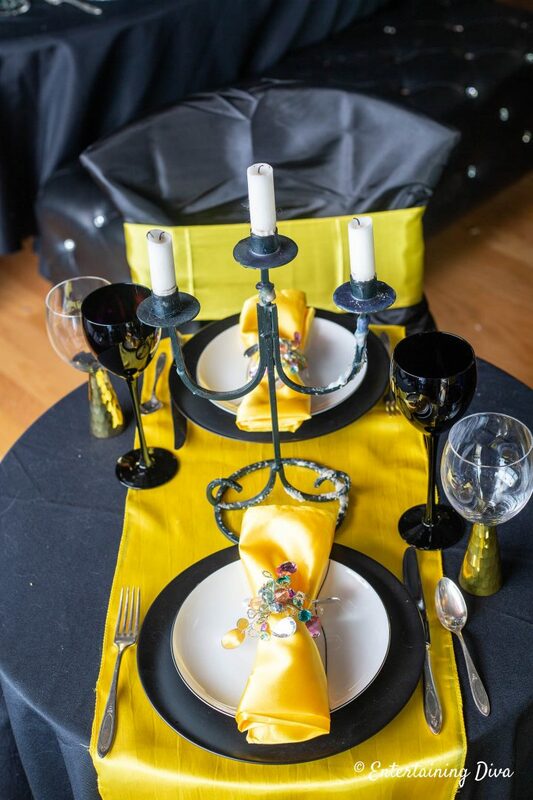 The final tablescape I created using my Harry Potter table decor ideas was for Hufflepuff House. The Hufflepuff house colors are black and yellow. 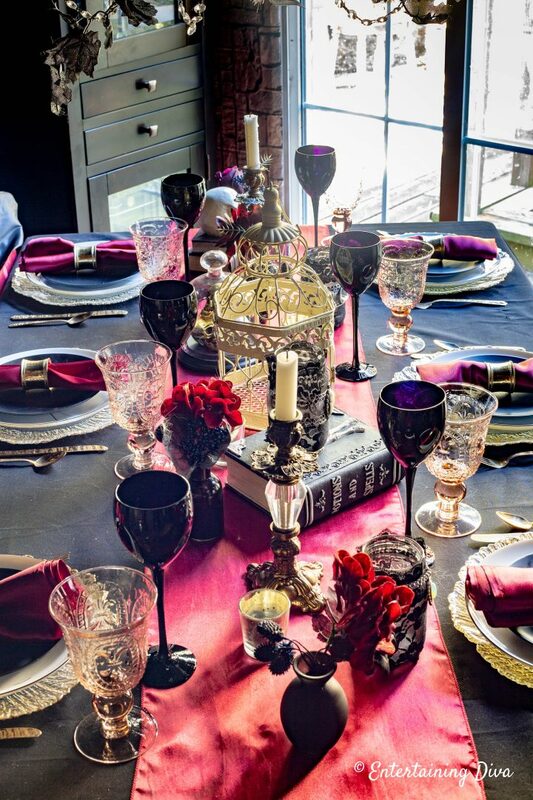 As with the other tables, I went with a black tablecloth, black chair covers and black wine glasses. 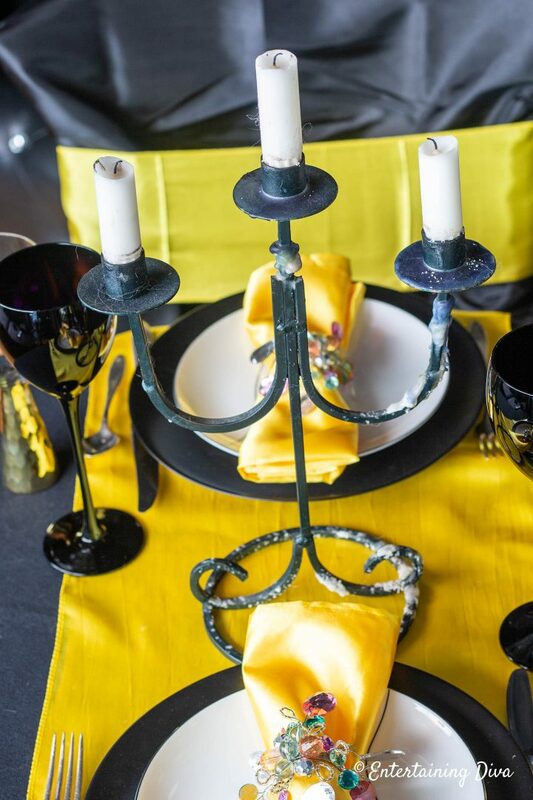 The table runner, napkins and chair covers are all the same color yellow. And I pinned the Hufflepuff house crest to the front of the runner. 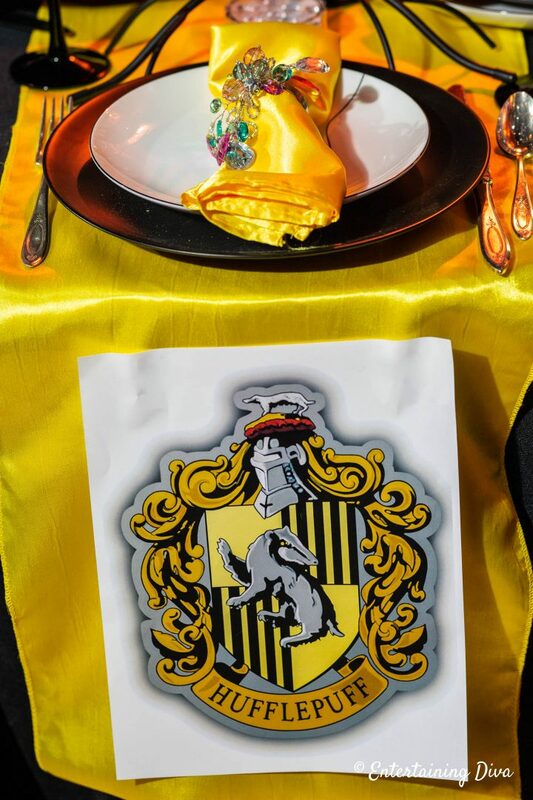 As you can see, this is the smallest one of my tables, so I didn’t have much room to work with when it came to the Hufflepuff House centerpieces and place settings. Since there wasn’t enough room for chargers, I used black dinner plates with white salad plates right on top of the runner. Since those are the Hufflepuff House colors, it actually worked out pretty well. For cutlery, I decided to go with silver just to add a little contrast to all the yellow. And the sparkly napkin rings help with that, too. With the size of the table being so small, my centerpiece space was very limited. So a small black candelabra was about all I could fit. But it still works since it fits in with the Hufflepuff House colors. 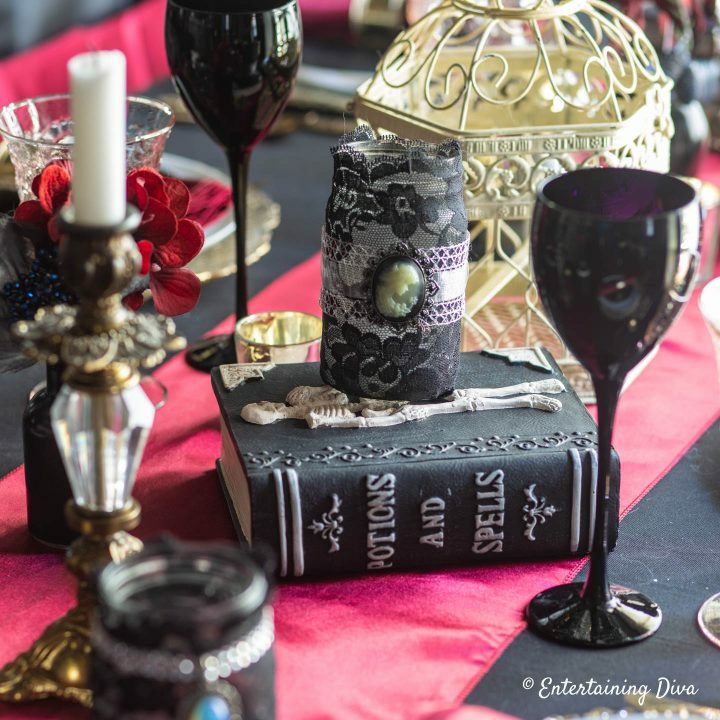 Have comments or questions on our Harry Potter table decor ideas? Tell us in the section below.